I remember making my first visit to Laughlin as the scramble to build casinos here was in full froth. 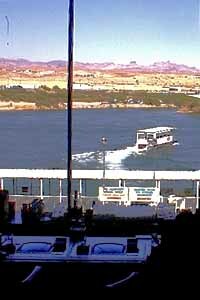 The Colorado River is Laughlin’s centerpiece. The main boulevard was still unpaved, with giant pot holes that made the drive seem like an amusement park ride. Later on Ted Fineran gave me my first formal tour. Ted was managing the Chamber of Commerce then, and as he drove from one recently constructed resort hotel to another, he pointed out that there were only 92 actual residents in Laughlin. Spurred on by Laughlin’s prosperity, Bullhead City Arizona, across the river, has grown into a wilted version of a small American town, populated by the hundreds, then thousands of employees of the Nevada-side casinos. It is still growing — there’s an airport with flights bringing visitors from hither and yon. 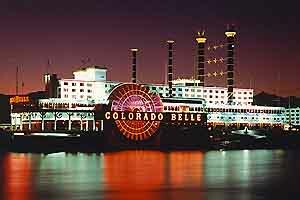 Still one of the most photogenic casinos in the state. A vast upscale enclave called Laughlin Ranch, is being developed on the east bank (Arizona’s West Coast), with the 18-hole golf course already completed. They are adding a beach club and boat launch, among other river-related enterprises, and they are adding Shopping with a capital S. Oh, yes, and custom home lots so you can live there. Even Don Laughlin must be surprised. He might have foreseen the day when his Riverside Resort Hotel would be the flagship of a fleet of big resorts on the west side of the Colorado River, but did he ever imagine that he’d inspire the gentling of the Arizona badlands across the river? I doubt it. Laughlin has long been known for catering to an older clientele — the Ramada Express has an adults-only tower — with inexpensive food and bargain rate rooms, but there’s some effort being devoted to lowering the age demographic and offering more upscale room options. There are 10,700 hotel rooms in the 11 resort hotels, fewer than last year’s count because so many smaller rooms have been combined and upgraded to make suites. 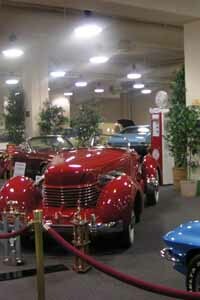 The Riverside Resort embraces two separate automobile collections. Once upon a time Laughlin was referred to as a small Las Vegas. But Las Vegas has evolved into mega-resorts built as architectural extravaganzas while Laughlin stays pretty much the same as it’s always been since the frenzy early years. It’s ten years now since the newest casino was built (the Avi on the Fort Mohave Indian Reservation), ten years since the last major expansion (the Riverside’s second tower). I like that. I get nervous when the world gets to whirling too fast. But even as the hotels upgrade the rooms and pursue a somewhat younger crowd, Laughlin’s pace is slow and friendly, and I hardly ever get any work done here. No wonder I enjoy it so much. 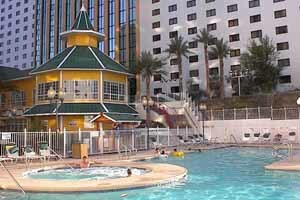 And I might as well confess that when we visited Laughlin last time I fell suddenly, unexpectedly and utterly in love. Have you had the experience? Stunning, isn’t it? 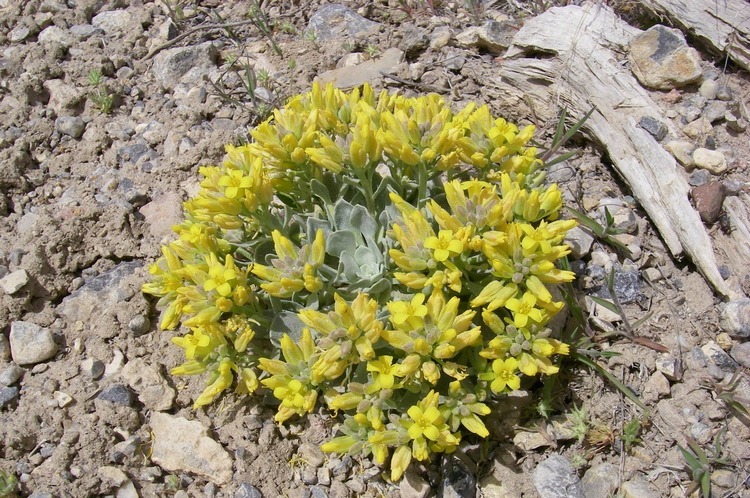 Exalted, exuberant and exquisite. Yum. In this case I tumbled head over heels for a white 1938 Buick Special sedan. My heart is racing as I type this. I could have bought her freedom for $38,000. But I had to put this . . . this . . . curvaceous dream made of steel, glass and chromium out of my mind. I am wed to the red Jeep Cherokee in the parking garage and I must be (sob) faithful. 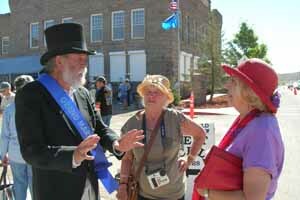 The 2005 Goldfield Days was a fine success as the old city teemed with visitors who strolled the streets during the day and danced on them at night. Such esteemed local chefs as Silent Sandy Harmon and Ginnie Mae’s Donuts served up their scrumptious specialties to appreciative customers. The sky was clear and sunny and so was the mood. It was an especially excellent day for our family. Not only did I reign as Grand Marshal of the Great Parade, but Chris and John Toll teamed up with a Goldfielder named Lucas to take second place in the 3 on 3 basketball tournament at the gym. 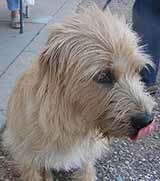 And to top it all, our dog Shorty took a blue ribbon in the Sunday morning pet parade. He beat out Clementine the goat, the odds-on favorite, and a peppy little short-legged dog dressed in plaid, by sitting on command and looking adorable. We haven’t done this well at a municipal celebration since 1970 when Sam Toll won the Boys’ Shoe Race at the Eureka 4th of July Celebration at age 7.
friendly, festive spirit in the air throughout the weekend. 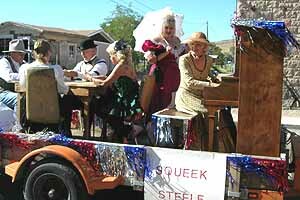 Our Virginia City neighbor Squeek Steele played music in the parade and on several pianos around town as the weekend progressed. As she was warming up the night before at the Santa Fe Saloon with a brisk rendition of “Tiger Rag”, the black keys all cracked apart and went flying. She and husband Roger spent a couple of hours gluing them back down before her first performance the next day. Bronze, silver and gold medallions were struck to memorialize the arrival of the railroad in 1905, and t-shirts sold briskly. Even beyond the weekend celebration the ruined old city is showing some life. 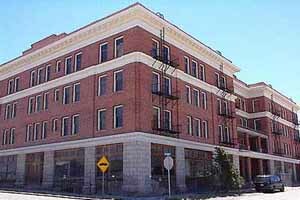 Owner Red Roberts came to town to visit the Goldfield Hotel which has been sitting quietly since he bought it at auction two years ago. Personal circumstances have prevented him from giving the magnificent old structure his attention until now, but in an interview with Carol Sirnes of the Pahrump Mirror he was clear that work will begin on the hotel in the spring of ’06. “Next spring I’ll start here with full force. Super Run Classic Car Show 2005 will be held Thursday, September 22 – Sunday, September 25in the Water Street District of downtown Henderson. More than 1,000 creampuffs, all makes and models, will be on hand: vintage classics, hot rods, street rods, muscle cars, competition and custom vehicles.Chubby Checker, himself a vintage classic, is this year’s headliner. It’s free and open to the public. 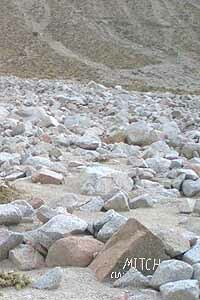 Doobie Road is now buried under an avalanche of pink granite from the steep mountainside to the west. A treasure has been badly damaged. Properties were auctioned by Esmeralda county, and some of the lots auctioned in previous years already have new stuff on them. Surely every Nevadan wants a little lot in Goldfield to park an Airstream, plug into the grid and rest up in the quiet little husk of what was once a noisy, thriving metropolis, rift with mighty passions: organized labor was on the march, and the company men carried guns. Now the wind riffles through the joshua trees, and the birds make most of the noise you hear, except for the occasional slap of a screen door or the grumble of an 18-wheeler crawling down Crook Street. 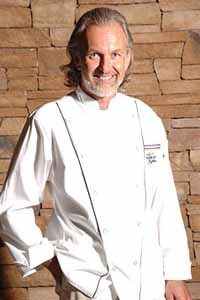 Celebrity chef Hubert Keller: a passion for house music — who knew? Jeff Johnson, Reno neon artist and Bruka Theater member; and Pete Froslie, creator of the giant etch-a-sketch board in 1997 . . . Michael Politz keeps his Eye on Las Vegas and his ear to the ground: “In a historic first,” he writes enthusiastically, “internationally acclaimed super star Chef Hubert Keller will take over the turntables at MGM Grand’s Tabu Ultra Lounge and share his passion for house music with the masses. Not only will it be Keller’s first ever public nightclub set, but it is also the first time a four-star chef has crossed over from the kitchen to the DJ booth” . . . .